A DIY diary for YOU to complete with your own jokes, scribbles and doodles! Nikki feels like a total dork when she loses her diary. She writes in it every day, and it’s a social essential. The hunt is on – and while she looks, dreaming up theories about where it might be, Nikki can’t help putting together a list of important diary-keeping lessons to remember in emergencies like this one! Packed with Nikki’s trademark humour and art, this cool book not only features a brand new funny story, but also heaps of space where you can write and draw your own entries. Fill it in with your own dork-tastic stuff to keep Nikki in the picture! 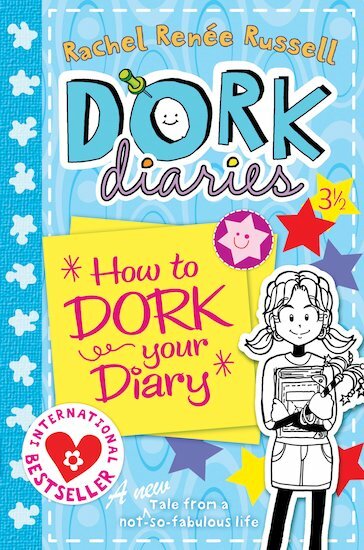 You have to buy this, you can be your own dork and have your own dork diary, empty all of your thoughts into this book and use your art skills too. So buy this and get stuck in!